Here are some shots of the legendary Ann Casey going up against another legend, Judy Grable. Ann was born on September 29th, 1938 in Saraland, Alabama and wrestled from 1962 to 1990. During her career she held the NWA United States Women's Championship, the USA Women's Wrestling Championship, the Southern States Ladies Championship and the Mississippi State Ladies Championship. 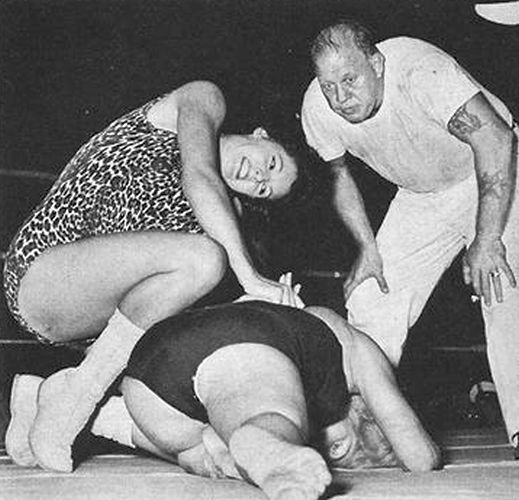 Judy was born on August 21, 1935 in Bremerton, Washington, and wrestled from 1953 to 1966. She was the NWA Southern Women's Championship twice. Judy Grable passed away on May 11th, 2008 after living with diabetes, strokes, and Alzheimer's.